Being Titan, they go overboard with the variant covers. Titan Comics’ Doctor Who range often leaves me with a strange taste in the mouth. They can be singularly awful. Parts of a recent multi-Doctor event Lost Dimensions were downright incoherent. 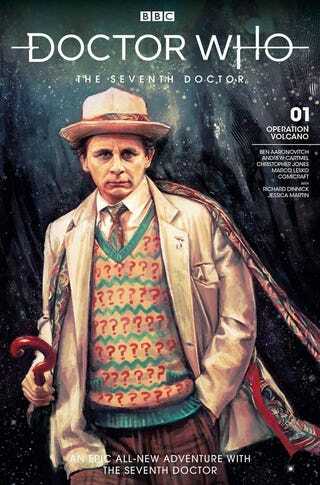 However, I was pleasantly surprised by the first issue of a new mini-series spotlighting Sylvester McCoy’s Seventh Doctor. This new tale is scripted by Ben Aaronovitch and Andrew Cartmel, respectively script writer and script editor for that era of the time traveling show. Art is by Chris Jones and Marco Lesko. Action for Operation Volcano bounces between 1967 and 2029, reuniting The Doctor and Ace with some familiar faces from Remembrance of the Daleks. In someways it is reminiscent of comics produced for Marvel’s Doctor Who Magazine after the television show went off air and while it might be a premature comparison, another Evening’s Empire would not be remiss. There are a few twists and a nice little cliffhanger to whet the appetite. There is also a supporting feature, Hill of Beans which might be described as What Mags did next. In fact I think that’s how they describe the tale. More, it was drawn by Jessica Martin who played Mags the Werewolf in The Greatest Show In The Galaxy.